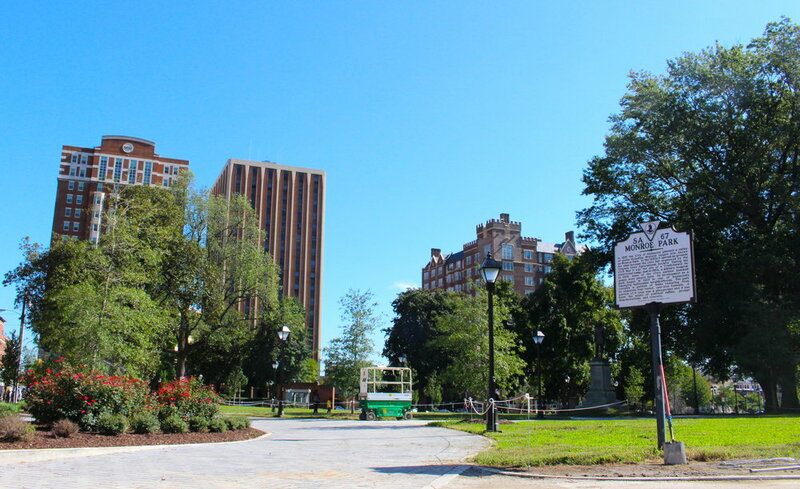 Almost two years after the jersey barriers and orange cones went up, closing off the most central of Richmond’s parks, Monroe Park reopened last week. It was strange to walk through the park Wednesday morning after such a long time of not being allowed within its boundaries and to see how many people had swiftly reclaimed it. Students were already sitting at the new green tables and chairs under the trees and by the fountain, studying as nonchalantly as if they had been there every Wednesday for weeks while an older man read a newspaper near the police substation and downtown workers in rolled-up sleeves, lapels and high heels passed through in knots, papers under their arms. It struck me as I passed along the paths that with the park reopened, we are seeing for the first time some views that have never been seen before. When Monroe Park was closed down, the renovated Gladding Residence Hall was only a plan on architects’ drafting tables, with demolition of the 1970s- and 80s-era buildings that formerly sat on the site about to enter full swing. Today, the 12-story building is complete and home to a new crop of freshmen, most of whom have never known the city without it. Down at the eastern end of the park, a glimpse north catches the new Institute of Contemporary Art, a building that still fills me with awe when I see it, its rooftop like a glowing white wing above Broad Street. And depending on when you find yourself in this eight-acre green space, a look east along Franklin Street will capture a view very different from that seen in 2016, with half of the road now taken over by the new bike lanes and still somewhat inscrutable floating parking. As if to emphasize all this newness, as I paused by the statue of Col. Wickham near Monroe Park’s western edge, one young VCU student came cruising up on one the new Bird scooters and, catching sight of a friend, called out, “Dude, have you tried one of these yet?” “Yeah, the other day,” his friend replied. “They’re pretty sweet.” Who knows—maybe he was riding the Bird scooter home to the Gladding Residence Hall. Of course, amid all the newness, much of the old remains. Monroe Park is, according to the Monroe Park Conservancy, a nonprofit with a 30-year lease on the site, “Richmond’s first and oldest municipal park.” (They have a terrific overview of the site’s history by historian T. Tyler Potterfield, of Potterfield Bridge fame, here.) Originally known as “Western Square,” the land for the park was acquired by the city in 1851 and in 1853 was converted into a fairground by the Virginia State Agricultural Society (note that the present State Fair of Virginia—ongoing now until Oct. 7!—traces its history back to this event). A plan to transform the site into a legitimate urban public park was drawn up and executed in 1871–1872 after the city annexed the land on which it sat from Henrico County. There’s been much controversy over the effect of the park’s renovation on the homeless population that formerly called it home. If the park has over the years served as a kind of symbol of what kind of city Richmond is—an area still dependent on agriculture in the 1850s, a Confederate stronghold during the Civil War (when the park was a training camp), an urbanizing reconstructed city in the latter part of the nineteenth century, and on and on—it’s interesting to think what this newest iteration says about where we are today. Some might say the new park is nothing more than sweeping new evidence of gentrification; others that it’s a sign of urban resurgence. And then, of course, like most things, it could be both.